Sharing the Wasatch Mountains with clients since 1984. Large Private Tour: $4,300 accommodates 7-12 clients Private tours allow the purchasers to decide the departure location, 1 direction of transportation (either to the resort starting location or back from the ending resort) & request resort inclusion preferences. Private tours are only available if space allows (availability calendar) & operate under the same safety provisions as the daily scheduled tours. All participants must be advanced to expert skiers in good physical condition. The day requires walking, hiking, traversing, and of course skiing, but all this is done in diverse snow conditions. In the backcountry, Mother Nature will decide the snow conditions, but we will always search out the best snow, as we want to ski quality too! Participants must be 16 years or older. Participants between ages 16 and 18 must be accompanied by a parent or legal guardian. This tour is not designed for the timid. Due to the nature of the Interconnect Adventure Tour, snowboarding is not permitted. Scheduled Interconnect Tour spaces are $395 per person and include two Ski Utah guides, lunch at one of the on-mountain resort restaurants, lift access, transportation back to the point of origin* and our coveted finisher's pin (gratuity not included). Monday, Tuesday, Wednesday, Friday and Sunday. Opportunities to experience Deer Valley, Park City Mountain Resort, Solitude, Brighton, Alta, Snowbird & the backcountry terrain between these resorts. This tour covers an average of 25 miles, requires good physical condition and the ability to ski variable ski conditions. Thursday and Saturday. Opportunities to experience Snowbird, Alta, Brighton, Solitude & the backcountry terrain between these resorts. This is the more advanced tour, requiring more hiking, more sidestepping & a stronger skier than the Deer Valley departing tour. 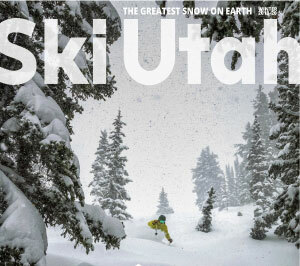 Private Tours include: custom route & terrain opportunities, custom starting & ending resort, two Ski Utah guides, lunch at one of the on-mountain resort restaurants, 1-way transportation (either to the departure location from hotel/lodge/house within the Salt Lake - Park City area or back to a Salt Lake - Park City hotel/lodge/house from the finishing resort), and a finisher's pin (gratuity not included). If you would like to purchase an Interconnect Tour as a present, we can issue a certificate that is good for the purchase price, for the life of the tour. You can purchase a gift certificate from our online gear store. For more information or to book over the phone, call 801-534-1907, Monday through Friday, 8:30 a.m. to 4:30 p.m. Mountain Standard Time. Origin* : Scheduled Tours - Only Deer Valley departing tours have transportation included to get them from their completion spot, Snowbird, back to the point of origin, Deer Valley's Snow Park Lodge. six*: The goal of the Interconnect Tour is to give our clients a unique, fun and safe experience. The process of obtaining those goals may not allow the chance to explore all resorts. In this video, our lead Interconnect guide, Deb Lovci, takes you through a typical day and helps answers some hanging questions. Looking for the perfect Interconnect ski? We have partnered up with Cole Sport, Powder House, and Sports Den to offer clients a 25% discount on Rossignol demos. All Interconnect participants will be outfitted with Ortovox's best-selling avalanche beacon, the 3+. The 3+ model represents a monumental step in avalanche transceiver advancement.